WALLA WALLA, Wash., -- The U.S. Army Corps of Engineers seeks information on firms to perform cavitation and linkage repair on Unit 1 of the 810-MW Lower Monumental hydroelectric project on the Snake River in Washington. Responses are due Nov. 26. 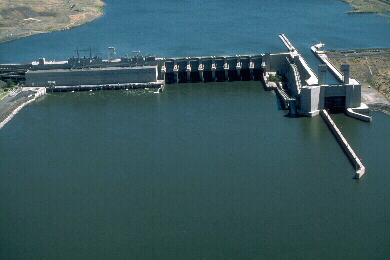 As part of ongoing rehabilitation, the Corps took bids in November for replacement of diesel generators and switchgear at Lower Monumental and two other Snake River projects. The Corps' Walla Walla District now seeks information to identify small businesses, HubZone small businesses, and Service-Disabled Veteran-Owned small businesses with the ability to perform the work. The information will be used to determine whether to set aside the work for such firms or to open unrestricted competition. The Corps seeks a contractor to check the alignment of the Unit 1 generator, then disassemble the generator and Kaplan turbine assembly. After removal of the turbine runner, the contractor is to disassemble the runner hub assembly for installation of new, government-furnished blade linkages and associated hardware and reassemble. The contractor also is to machine out cavitation within the discharge ring, perform minor repairs to the liner, and weld in a new stainless steel discharge ring. The work also includes weld repairs to cavitation damage on the runner blades and hub. Valued at between $1 million and $5 million, the work is to be performed from September 2011 to April 2013. A sources sought notice may be obtained from the Federal Business Opportunities Internet site, www.fbo.gov, by entering Solicitation No. W912EF11RSS05 in the "Keyword/Solicitation #" box. Responses are due Nov. 26. For information, contact Phyllis Buerstatte, Contract Specialist, U.S. Army Engineer District, Walla Walla, 201 N. Third Ave., Walla Walla, WA 99362-1876; (1) 509-527-7211; Fax: (1) 509-527-7802; E-mail: phyllis.l.buerstatte@usace.army.mil.